The What: Altinex has introduced the MT322-105 and MT322-107 (International version) Power Distribution Cards for use with the company’s MT302-201 Digital MultiTasker. Both units distribute AC power from a single AC source to multiple AC outlets. The What Else: The new MT322-105 and MT322-107 are designed with safety as a top priority. Both cards have built-in current measuring circuits to detect load levels. The value of these loads may be read over the IP port and an alarm can be triggered when power is exceeded. The MT322-105 contains an IEC male connector for the AC supply input and standard NEMA 5-15R power receptacles for the three outputs. Built-in sensors alert the user by flashing the LEDs when the load exceeds 9.5 amps, as well as a warning message over the IP port when the current draw approaches the maximum 10.5-amp limit. The MT322-107 international version contains one IEC male connector for the AC power supply input and three IEC 320 female outlets. With this model, sensors alert the user when the load exceeds 8.5 amps and a warning message is sent over the IP port when the current draw approaches the maximum 10-amp limit. Both cards have safety provisions that cause the cards to automatically start turning outlets off should the system approach maximum power draw. A message informing the user that outputs are being shut down is sent to the MT302-201 Digital MultiTasker’s IP port. Both the MT322-105 and MT322-107 are able to turn audio/video equipment on or off in a sequential order, which may be defined using IP protocol commands. The time delay between switching is also programmable from zero to 50 seconds. The threshold level for the on/off-detect feature is adjustable to accommodate different loads and determine when AV equipment is on or off. This feature is particularly important for DVD players or any other equipment that has only IR control capabilities. Using this feature, the control system can determine if the device is on or off by the amount of current it draws. 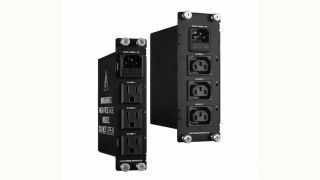 The Bottom Line: With these one-in, three-out AC power distribution cards, the outlets can be connected to any type of audio/video equipment—making both cards well suited for controlling power to multiple AV equipment units.